…though not entirely by choice. The following video shows some of what happened throughout the day. At 48 seconds in, you can see and hear a hooded man telling the terriermen to get their dogs out and “just f**king get out of there” (we searched the area they had been in and found a badger sett where the hounds had been speaking before terriermen arrived, luckily not yet tampered with). This man is one Will Hunt of Redmarley, Ledbury Hunt supporter (and buddy of the terriermen), horse trainer at Will Hunt Breaking and Training and who some of you will recognise as the guy who drove (at speed) around the Redmarley / Eldersfield / Staunton area of the Gloucestershire badger cull zone the last couple of years in his 4×4 pick-up WH03 BAT, stopping occasionally to shout at badger patrollers about how many badgers he’d shot recently. Despite not being thought to be a shooter. Seems there aren’t many locals that have good things to say about him either. During the day, the hunt headed back down the hills having chased a fox up into them (as seen in the video) and carried on hunting around Castlemorton Common. 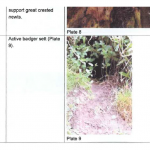 At one point, during a (non-violent) dispute with some landowners regarding footpaths, sabs had decided to use a different route to catch up with the hunt. Terriermen and buddies arrived on their Toys ‘R’ Us quadbikes and a masked-up Will Hunt took exception to an unmasked 3C sab who was currently walking away with his back to him, pushing him from behind and hitting him in the face when he failed to react aggressively before calling the sabs “f**king faggots”. The sab decided to contact the police about the incident a couple of days later just to see where it would go. There are certain things we put up with as a group and as individuals and times when we decide hunt staff and supporters have crossed the line. 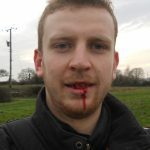 The police took the allegation seriously, viewed the footage and interviewed Will Hunt who admitted getting unnecessarily heavy-handed with the sab and all sides recently agreed to deal with the situation by way of community resolution. As part of this, Mr. Hunt has had to write a very apologetic (ha!) letter to the sab involved and pay £100 to a charity of the sab’s choosing. 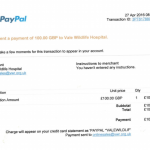 With Vale Wildlife Hospital doing a great job for wildlife within the three counties and taking in many injured and sick animals who we find whilst out in the fields, the sab decided they should benefit from the incident. 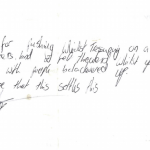 As for the apology letter, well, it certainly outdoes other apology letters we’ve received from hunt staff in the past! Obviously when you’re masked up with your mates and you want to make a point about sabs being masked up, naturally you’d assault the only sab not covering their face whilst they’re walking away from you with their back turned… good logic there bro! All in all, not a bad outcome from the situation and Will Hunt is going to need to be on his best behaviour in the future if he still wants to get into Australia to meet his favourite horse trainer. See you in the fields! We are having a small I.T. issue regarding images on the site at the moment, which we should have fixed in a few days, so all our pages and blog posts should look as good as normal. In the meantime, we’ve made sure that our recent addition to the site is looking as planned which is our priority at the moment. So please enjoy the article “Hunts vs Badgers” and share as you wish. This doesn’t mean we don’t still need to be out there sabbing and monitoring hunts or being on our guard when fighting the badger cull, but it should mean things stay as they are. About 30% turn-out overall in the county, thousands of spolied ballot papers and a landslide win for Surl over Windsor-Clive once the 2nd preference votes were counted. Now that that is over, we’ll see you back in the fields! Just a reminder not to vote Conservative in Gloucestershire’s Police Crime Commissioner election today. 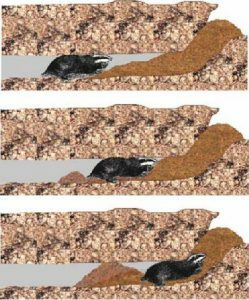 The photos below are of an ‘artificial earth’ on land where the Ledbury hunt on the Forthampton estate. Will Windsor-Clive, the Conservative PCC candidate is the Ledbury Hunt Chairman. Whichever candidate wins today’s election, the need for sabbing and monitoring will remain. But is Windsor-Clive really the right person to be in charge of police budgets and holding officers to account when his own organisation is involved in law-breaking? An animal rescue group has been warned that it could be breaking the law if it recovers injured wild animals from Forestry Commission managed land. 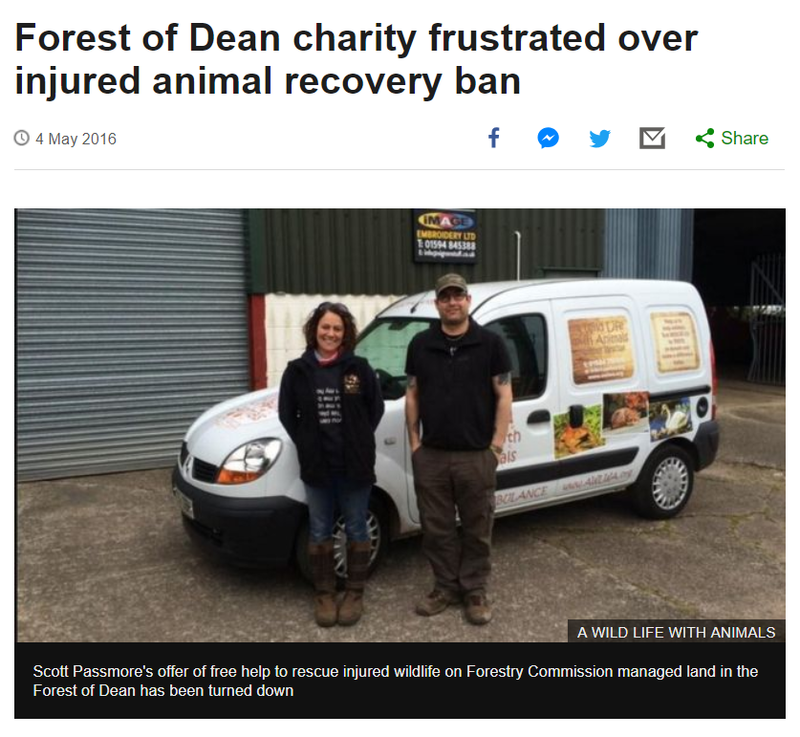 The charity A Wild Life with Animals has offered to run a 24-hour call out service for free in the Forest of Dean. Forestry Commission Rangers work 09:00-15:00 from Monday to Friday. The charity said leaving injured wildlife for more than 48 hours was “inhumane”. 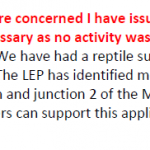 Mr Passmore said he would be writing to The Department for the Environment, Food and Rural Affairs (Defra) to ask whether the FC might be in breach of animal welfare laws. Elections for Police and Crime Commissioners will take place this Thursday 5th May. Martin Surl, an ex-police officer, is the current PCC and has been during the last few years of badger culling in Gloucestershire. This year the elections will take place and a candidate running for the position is Will Windsor-Clive, Tory and chairman of the Ledbury Hunt. 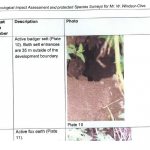 Mr. Windsor-Clive has made various planning applications on his land, one of which may have been affected by the presence of an active badger sett in the area. The Ledbury Hunt, their terriermen and supporters have been caught on various occasions, this last season and previous seasons, breaking the law by chasing foxes, attempting to dig-out foxes (most of the time from active badger setts) and a large number of blocked badger setts have been found in areas in which they hunt (found freshly blocked on hunting days) and we caught the whipper-in and the huntsman’s son heading into a wood at 7am on a hunting day where a badger sett had been repeatedly blocked. We suspect that the hunt use a number of artificial earths, like many hunts have done (and continue to do so). Whilst sett-surveying we found this artificial earth which we believe is on land belonging to the pro-cull shooting estate, Forthampton Estate. It is in good nick for something which shouldn’t have been used since 2004… Forthampton gamekeepers and Ledbury hunt support and terriermen were spotted attempting to use the artificial on February 19th this year, but were foiled by members of our sab group who were laying-in-wait for them in the area. Supporters of the hunt have been investigated by the police on numerous occasions: we went through with a community resolution 2 seasons ago when supporter Rob Lewis broke a sab’s camera (he had to pay £200 towards a replacement), a supporter / terrierman has recently agreed to a community resolution having shoved a sab this season (more on this soon). Huntsman Mark Meladay is currently being questioned regarding an incident from a children’s meet back in February (the same day that supporters and terriermen held a dead fox out of a vehicle’s window to try and upset sabs – a vehicle pulling a trailer with a different number plate – an additional criminal offence). Rob Lewis, once again, has been accused of harassment against a female sab, incidents including comments he made to her regarding being on her period when she picked up the dead body of a fox after hounds had given chase and was covered in blood from it and various occasions where he’s told her to ‘be careful driving home’ and so on. There are other open cases relating to aggression and assaults currently ongoing. Some of these incidents can be seen in our end of season video from this year – the man telling others to ‘get the dogs out’ is Will Hunt who was known to be driving around during the cull, yelling at anti-cull patrollers about how many badgers he had shot (despite not being thought to be a shooter). Whipper-in Tim Pearce-May was also active during the cull. We are concerned that the chairman of a hunt involved in criminal activity would be running for the position of Police and Crime Commissioner in Gloucestershire. Is he somehow completely oblivious to the activities of the hunt he is chairman of or is he entirely aware of what they get up to?